We Make Amazing Websites – Get yours Today! Your ideas and your company need a website in order to get better results and expose your products or your services to the entire world twenty four hours. With Socialnet21 you get the best results at the best price. We are the first Web Design Agency in United States that offers an All in one Solution. Your project will be hosted with Socialnet21 and will be managed with cPanel control panel. Socialnet21.com works with wordpress and prestashop. All our projects includes paid Advertisign on Google and Facebook. Our team provides the best quality for your web design project. Our team uses WordPress and Joomla like a standart in order to develop amazing projects based in corporate websites for companies, artists, and others that requires a real and professional presence online. We use professionals templates that are modified in order to meet the requirements of our customers, and reach the goals that we define from the beginning of the project. You have the product or service, and we have the experience in order to setup your own e-commerce platform and advertise properly in order to get sales online. Our team develop e-commerce stores based on Prestashop, Woocommerce and Shopify. In just 7 business days you can have your e-commerce store ready to start get profits online. Start your own online store. Start your own Shopify store. Start receiving orders online for your products. When you start a web development project with Socialnet21, you receive addons services in order to keep your website running and reach the main goal established from the beginning. That is why our customers love the Web Development Service of Socialnet21, because we are with you each month, every day. We can register your corporate domain and setup the web server for your project. We provide security to your project, that is why your website will be ready to use SSL Standard. We set up your corporate mailbox in your Smartphone and Offices computers. We create a Corporate Google Campaign, in order to get the visitors that you need for your business. We create a Facebook Campaign, in order to get fans for your corporate Facebook Page. With this extra, you get peace of mind, because your website will be always with the last version of software and information. We will post corporate information and some relevant articles in your social network in order to get interactions for your business in social networks. If you need logo, business cards, flyers, banners and more our web designers will be glad to help you to create all content that you need. Describe your goals with your new website, share related websites that make the same like you, and even share with us your budget for your project and in that way we can Analyze it and in just 12 hours you can receive your quote. Once received your quote we can discuss about all aspects of your website. Once we receive your specifications and needs, our team generate a complete quote that can be discuss with you and your team in order to clear up all the information and aspects quoted, in that way you can analyze the proposal and make a great investment for your project or company. If you are agree with all aspects described in the quote, we make the arrangments in order to receive all the information that we need to build in time your dream website (Pictures, Logo, Information, Brochures, and others). As soon as you sign the contract and we get the requirements, we start to build your project in record time. Once received all the requirements, our team starts to build your website and coordinate virtual meetings in order to check the progress and fix any change that you consider. The main idea in this stage is build your dreamed website and setup all the web environment for your project. Good News! your website is ready to launch, in this stage you checked everything and the project is ready to go online and start to receive visits and meets th goals proposed at the begining. Our team will be available month to month in order to update the website and be your social network manager. Fast Car Ecuador is a rental car company based in Quito, Ecuador. We developed the website and we manage even their social network (Instagram, Facebook) and their Advertisign in Google. 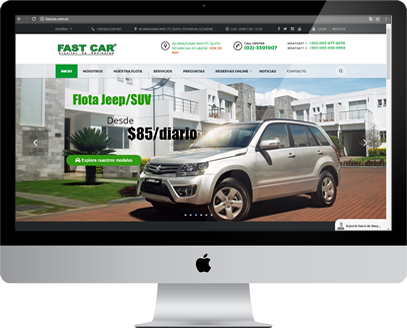 Now Fast Car receives a lot of request from other countries and from Ecuador, thanks to their new and modern Website. We work for a wide range of industries that need a professional website running!